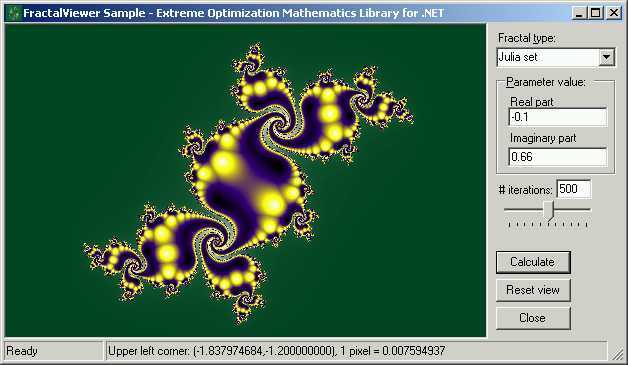 The Extreme Optimization Numerical Libraries for .NET contain extensive support for working with complex numbers. The FractalViewer sample illustrates these capabilities in spectacular fashion. A fractal is a mathematical shape that is so irregular that its length is infinite even though it is bounded by a small region. Fractals are usually self-similar. This means that parts of the fractal will look like the whole. This self-similarity is independent of scale. You will find parts of any size, no matter how small, that are similar to the entire fractal. Fractals get their name from the fact that a property called the Hausdorff dimension of a fractal is a fractional number, not an integer. A normal curve has Hausdorff dimension 1, while a normal two-dimensional area has Hausdorff dimension 2. Fractal curves have Haussdorff dimension somewhere between 1 and 2.
with starting value z0 = 0 is bounded. Once the iteration lies outside the complex circle with radius 2, the point c is known to lie outside the Mandelbrot set. The number of iterations needed to reach this threshold is called the escape time. The Mandelbrot set can be visualized in the following manner. To every point (x, y) in a grid corresponds a complex number c = x + iy. The point (x,y) is colored according to the escape time of c. If a specified maximum number of iterations is reached, c is assumed to lie on or inside the Mandelbrot set and colored black. with starting value z0 = c is bounded. If k lies inside the Mandelbrot Set, then the points for which the above iteration is bounded define a fractal. Every value of k generates a new shape, so the variations are endless. The standard Julia Sets are created using a quadratic iteration formula. Using polynomials of higher order gives rise to another class of fractals. The fractal viewer sample shows Julia sets for order 2, 3, 5, 6, and 7. In the original coloring scheme, the inside of the fractals is colored black. Various schemes have been devised to make the inside look more interesting. The scheme used in this sample is to color the inside using the least distance from the origin produced during the iteration. The FractalViewer window is divided into two panes. The left pane shows the current fractal image. The window represents a rectangle in the complex plane. The complex number corresponding to the top left corner of the left pain is shown in the status bar. You can zoom in on an area to view the fractal in greater detail. When you click the Calculate button on the right pane, a view of the Mandelbrot set will appear in the image pane. You can zoom in by clicking on one corner of the area you want to see, and dragging the mouse to the other corner. This will zoom the view so the selected area fits into the image pane. Dragging with the right mouse button produces the opposite effect: it will zoom out so the current area fits into the selected box. If things get out of hand, the 'Reset view' button can come to the rescue. Mandelbrot set The standard mandelbrot set. Julia set The Julia set for a given value. Julia set (zn+c) The Julia set generated by z = zn+c (n = 3, 5, 6, or 7). Lambda fractal A variation on the Julia set. Below the fractal type combo is the parameters box. The meaning of the parameters depends on the type of fractal. The Mandelbrot set has no parameters. All Julia set fractals have two parameters: the real and imaginary parts of the constant k in the iteration formula. with the parameter lambda a complex number. Once again, the real and imaginary parts of this number are the two parameters of this fractal type. Every Lambda fractal is equivalent to a classical julia set. Next on the right pane is a slide that lets you specify the maximum number of iterations. A low value will result in a faster plot, but will miss the more intricate detail at larger magnifications. It's usually a good idea to start with a low value (100-200), and increase gradually as you zoom in. Clicking the Plot button starts the calculation of the fractal. As the calculation progresses, the results are shown on the image pane line by line. You can cancel the calculation by hitting the Plot button again. The most interesting Julia sets are generated by points close to the edge of the Mandelbrot set. If you have zoomed in on part of the Mandelbrot set, and then change the fractal type to one of the Julia set types, the parameter will be set to correspond to the center of the Mandelbrot image. The code involves a lot of user interface and threading issues that are beyond the scope of this sample. Instead, we will focus on the implementation of the fractal calculation, and its use of the DoubleComplex structure. The image pane represents a rectangular area of the complex plane. This rectangle is defined by two complex values: _zLocation and _zSize. Both variables are initialized by the ResetPlotAreaView method and changed by the ZoomIn and ZoomOut methods. /// provides the formula for a type of fractal. /// Returns the initial value for the iteration. /// for this <see cref="IFractalProvider"/>. Complex numbers are treated just like any other value type. All arithmetic operators have been overloaded, allowing mathematical expressions involving complex numbers to be expressed in the familiar, compact form. Equivalent static methods are available for languages that don't support operator overloading. _zLocation: the complex number corresponding to the upper left corner of the image. The two outer loops iterate over the pixels of the image. The local variable z0 contains the complex number corresponding to the current pixel. The iteration is line by line, so the real part is updated at the end of each x loop by adding the length per pixel scale factor, _scale, to it. This value is reset at the beginning of every y loop. The imaginary part of z0 is incremented at the end of every y loop. Of interest to us is mainly the inner loop, which calculates the color value for the current point in the image. z0, the complex number corresponding to the current pixel, is passed to the Initialize method of the fractal provider to retrieve the starting value for the iteration. z contains the current value of zn. The inner loop then calls the provider's Step method. The inner loop terminates for one of two reasons. The pixel color is calculated differently for each reason. If the modulus of the current iteration value was greater than two, the color value is determined by the number of iterations. If the maximum nu When the color value of the pixel has been determined, it is set in the bitmap using the SetPixel method.